Alright. So you saw the first set, now let’s move on to more! More awards and more reader picks. Once again, if the award has an asterisk, it’s a Reader Pick, with or without my explanation. If they added one, it’s there! If they didn’t, well, that just leaves me to give a reason <malicious laugh>. Best Guy in a Suit: Neal Caffrey, White Collar. Step aside, Barney. There’s someone else suiting up now, and damn, he looks good. Best Woman in Heels: Maura Isles, Rizzoli & Isles. This woman sure gets a lot done in four-inch heels and a pressed dress, even when dealing with dead bodies. * Most Wasted Potential: Glee. It’s true. For a show with a huge fanbase and mad props for creating a new TV genre, they lost their way by focusing on huge guest stars and a big production instead of a cohesive storyline. Least Necessary Procedural: Law & Order: CSI edition. Oh, is that not a real show? I thought it was. It’s on every night for two hours at least, right? And it airs on every network? Wait, these aren’t all the same show? Most Ridiculous Premise for a Procedural: Castle. Ok, I know you fans out there must like it, but the idea that a successful novelist gets to spend his time on all these huge cases as a partner of a detective is rather incredible. Worst Show We’re All Watching: The Office. Where did the funny go? It’s run its course, but we all still watch it. And most of us don’t know why. Didn’t I Used to Be an Important Character? Award: Alaric, The Vampire Diaries. Well, it’s true, right? Now he’s arm candy, and occasionally says something smart from a book. Best Vampire Teeth: The Vampire Diaries. With the eyes and the subtle teeth, yes, the vamps in TVD certainly get the prize. Worst Vampire Teeth: True Blood. I haven’t tried to watch this series, solely because these teeth are so bad and look so fake. Plus, I hear they make a sound when they come out. Pardon me if I’ve already went with this post already, but it’s something that’s been on my mind recently. Does anyone feel like they’ve just been inundated with guest stars recently? It seems like every time I turn on a show, I see an old, familiar face playing a brand-new character. It feels like guest stars are the new black. Thumbs up or thumbs down: What do you think of guest stars? I think guest stars can be a fun surprise sometimes, but nowadays, you know months ahead of time that stars will be on a particular series. Don’t get me wrong. I realize that I help with the buzz a bit (I had a special post on Summer Glau being on Big Bang), but now they’re everywhere. Big Bang is certainly takes advantage of having people like Eliza Dushku, Wil Wheaton (repeatedly), and other guest stars all over it, and Glee is another. Heck, even How I Met Your Mother is a cuprit. It did bothered me that Community got a wee bit harped on for bringing Betty White on in its premiere, and yes, Community has had its share of stars (something that makes sense for something that leans so much on movie jest), but I don’t think that show is nearly as bad as others. I just wonder why people can’t depend on their cast anymore. Are they not pulling the audiences anymore? Do they just not have the talent? They’re now used as publicity ploys that bug me a lot. Instead of seeing a conveyor belt of guest stars, I’d much rather see a quality show that can depend on its main contingent. But what do you think? Thumbs up or thumbs down? And why? Last year, I watched Big Bang Theory on Mondays, and Community on Thursdays. Unfortunately, this year, CBS has made play for Thursday nights, and moved the highly rated Big Bang into the same timeslot shared by Community. This conflict has forced me to make a choice, which I am now turning into a call to action. If you enjoy clever, smart, inventive, sitcoms please please please ditch Big Bang and watch Community instead. Big Bang Theory is a very ordinary, formulaic show. I do find it enjoyable, and it has been funny in the past, but lately it’s gone downhill. The plots have been boring and cookie-cutter, both Sheldon’s weirdness and Wolowitz’s creepy horndoggery have been pushed a little too far and are now just stupid instead of funny. Sheldon’s “buzzinga!” buzz-word makes me want to throw my remote at the TV. Finally, the show has a laugh track. It’s 2010! Laugh tracks are for idiots! Laugh tracks are holdovers from the days of black and white TV, when producers thought audiences were too dumb to notice a joke! Laugh tracks do not belong on TV anymore; ever! Community, on the other hand, is full of subtle humor and inventiveness. The paintball episode, the Goodfellas episode, the police procedural episode, were all great and hilarious examples of TV creativity that you can’t find anywhere else. The writers of the show, knowing what they’re up against, are coming out of the gate with some great ideas for this year, particularly the stop-motion animated Christmas special. This show doesn’t need a laugh track, it’s too smart for that. This show, in fact, may have finally killed the laugh track for me; laugh tracks are now insulting. So, if you can, pick the smarter, funnier, more inventive show (Community) over the tired, old, formulaic one (Big Bang Theory) when you’re deciding what to watch on Thursdays. Sorry Big Bang. You had a good (albeit short) run, but like the lumbering dinosaurs, it’s time for something smarter and faster to come along an eat your lunch. Readers, don’t let mediocrity win. Thursday Open Thread: What will you miss this summer? What shows will you miss this summer? This can be shows that are coming back or are gone for good, but let’s keep it to shows that aired this season. On my list? Well, there’s definitely Community, and while I like One Tree Hill, I’m not sure I can really say that I’ll miss it. Big Bang Theory has been a bit of a Big Boring Theory, but I might just miss How I Met Your Mother. That could be, though, because I missed some this season, and it feels like I barely got a taste of it. So what about you? Anything you’ll be missing? Geez, is summer over yet? JC is a big fan of B-plots in his sitcoms. It’s something he missed in last week’s episode, and I guess the writer’s staff noticed. Why? Because it looks like they made up for it in this episode. What do I mean? Well, basically, nothing in this episode really felt like THE PLOT of the episode. First, they’re doing an experiment on the moon. Then Penny’s upset about who she’s dating. Then Leonard is trying to find out when it’s ok to sleep with an ex. And meanwhile, Raj and Howard are putting Sheldon on a dating site. That “meanwhile” is supposed to be the B-plot, I’m sure. But it was probably the most interesting of all. After all, it led up to that awesome moment when Sheldon meets his “perfect match”–someone I hope we’ll see more of next season. Sure, I knew it was coming (the interwebs have been publicizing Mayim Bialik coming on the show for a good number of weeks now), but I certainly enjoyed it. But Leonard? Well, not so much. I felt like we did this before. Didn’t some of this awkwardness happen the first time Leonard and Penny broke up? You know, when she thought he was being insulting about her not having a degree? Personally, I found Penny’s date to be more entertaining than anything Leonard was doing. And do I really think that Leonard is the one that made Penny realize her date was dumb? No. I’m pretty sure she’d get there anyway. I almost wish they’d surrounded the episode with Leonard dealing with Penny dating someone so dumb after him, trying to figure out why now she wants the complete opposite of him. It’s not that it was a bad episode. I laughed and enjoyed. But it’s a little disappointing to realize that the season finale isn’t pushing anything forward and is rather ho-hum. It’s not like the writers were afraid of cancellation after all. I’d say, they really should have just focused on Raj and Howard’s michievious online dating plans and ignored the Penny/Leonard equation. They’re no Ross and Rachel–and even they got annoying. Thursday Open Thread: Sheldon or Abed? CBS announced its new fall schedule yesterday, and it sent the TV world all a twitter. CBS moved one of its biggest comedies–The Big Bang Theory–to Thursday night. The show will now be against one of my favorite shows (and one that’s growing across the TV landscape as one of the best comedies currently on TV), Community. 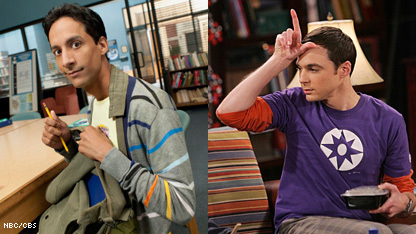 Are you on Team Sheldon or Team Abed? And if you’re wondering, so am I! If I had to choose, I’d choose Abed and the Community team all the way for my entertainment pleasure. But what about you? Do you have a preference? Are you going to toss some wonderful characters aside? Would you even choose at all and just do some awesome channel-flipping in commercial breaks? Then again, maybe we’re just talking characters. Maybe if these guys were your buddies and not TV characters, you answer might be different. Maybe some of you would choose one for one thing, the other for something else. After all, I think Abed would certainly be my Mobile Shoutout on Cash Cab if a movie question came along, but if it were science related? Well, get me Sheldon. So what do you think? Who would you choose–and for what? Let me know in the comments. Another week, another half hearted Big Bang Theory! Okay, I don’t mean to come off too harsh. Big Bang is one of those shows that can have some really great episodes, and some really awful ones. This one was neither; funny in moments but mostly unoffensively boring. Leonard gets in a fight with Sheldon about one of his many weird roommate quirks; Leonard recounts to Penny the story of how he came to live with Sheldon; Leonard and Sheldon make up, just in time to have another fight as the episode closes. The flashback describing Leonard and Sheldon’s first meeting and early time together as roommates takes up the majority of the episode; there isn’t really any B story thread in the episode, but rather several different viginettes describing Leonard and Sheldon’s early relationship (the first time they met, Sheldon’s ridiculous roommate contract, Leonard bringing a girl home and violating said contract, and Leonard bringing along Raj and Howard for the first time.) This all culminates in a mishap regarding some rocket fuel and the apartment’s elevator, in which Sheldon deftly intervenes to save Leonard’s life. It was nice, actually, to learn that there was a concrete, unselfish action by Sheldon that forms the basis of Leonard’s friendship towards him, and compells him to stick around even through Sheldon’s most idiosyncratic moments (and now we know that we can blame Leonard and his rocket fuel for the apartment’s broken elevator, though you’d think after seven years they would have gotten it fixed). Also funny were flashback Leonard’s hair, flashback Howard’s leather pants (yikes), and flashback Raj’s white suit. I also liked some of the winks toward geek culture from seven years ago, like the talk of Firefly, Babylon 5, and the Gamecube system hooked up to the TV instead of a 360. I also liked the first shot of Sheldon’s apartment, which held only a couple of whiteboards, a TV on cinderblocks, and a couple of lawn chairs. Sheldon attempting to find “his spot” on the new sofa that Leonard brought in was also a nice touch. While it was nice to get some background on the guys, I think the episode suffered a bit because there wasn’t any interaction between Penny and the rest of the crew and overall, there weren’t a whole lot of laughs (more like knowing smiles instead, which don’t quite get the job done). Since most of the show was spent backwards in time, there wasn’t any present character development so it felt like nothing really happened. It’s not like that’s a bad thing, just…. sort of boring.